How You Can Have a Healthier Relationship…with Food! This article was originally published September 4, 2014, by Mary Koenig, a program assistant for Student Wellness. She was in the school of Social Work and Public Health at UNC Chapel Hill. Protein shakes, whey protein powder… But when do you use these? Before or after exercising? How do you fuel up for a workout and how do you help your muscles recover? Ms. Mary Ellen Bingham, MS, RD, CSSD, head sports nutritionist at UNC, recommends “book-ending”. This means you eat something small both before and after your workout. To fuel up and in order to have enough energy to get through your time at the gym, eat within about an hour prior to exercising. 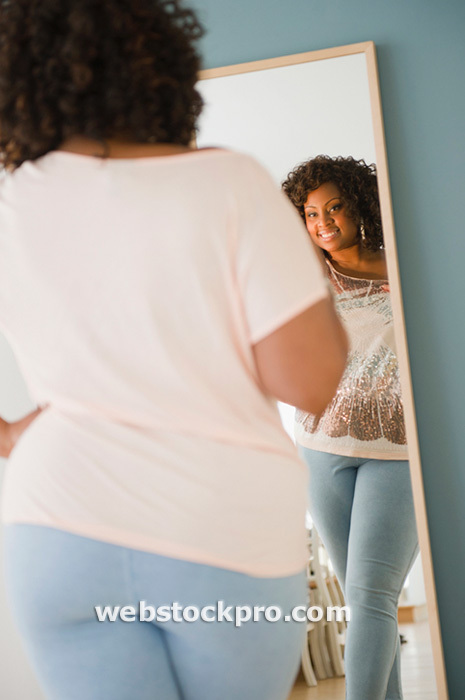 Then, eat again within 30 minutes – don’t wait until lunch or dinner time to eat. These don’t have to be complete meals, but more so, snacks. 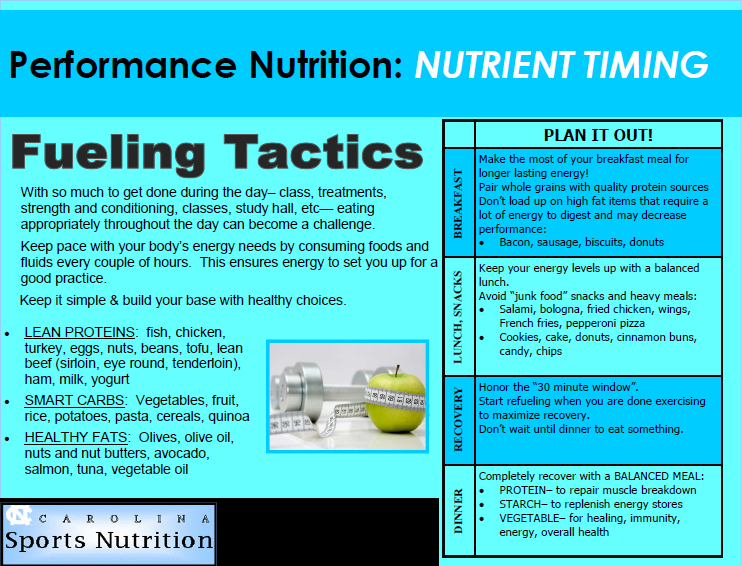 Check out the image below on nutrient timing that Ms. Bingham created. (Click for larger image). For pre-workout, carbs will give you the energy to push yourself and not get exhausted. Try crackers or toast with peanut butter, fruit, a small granola bar or a handful of pretzels. Post-workout, you want to refuel your muscles. First and foremost, make sure to drink water! All that sweat is going to leave you dehydrated, so you need to be drinking before, during and after your workout. Additionally, have a combination of both carbs and protein such as trail mix, a sports bar, a smoothie or – the classic drink that promotes fast muscle recovery – low-fat chocolate milk. Previously, I interviewed Dr. Abbie Smith, an assistant EXSS professor. If you read this interview (I don’t want to repeat it all! ), you’ll find other similar advice. Dr. Smith gave me nutritional advice for those trying to gain muscle, those trying to lose fat, what “cheat days” are all about and supplement information. That blog post is extremely informative and can clear up some further questions you may have about nutrition for athletes. So, if they’re right for you, continue with your protein shakes, nutrition bars or whatever your usual pre/post workout snack may be! Remember – carbs before and a combination of carbs and protein after.